VIEWS! VIEWS! VIEWS! Come experience this one-of-a-kind gem with breathtaking 270 degree panoramic foothill views. This 3,466 sq. ft. Frank Lloyd Wright concept home boasts vaulted wood beam ceilings, updated kitchen with newer appliances, wood floors & more. A 400 amp energy efficient service panel, solar, smart Nest thermostat, UV-blocking sunshades, newer vinyl windows & newer HVAC, roof, and water heater. Newly fenced 1.65 acre lot with 20x24 ft. pole barn, tool shed, and RV parking. Located less than one mile from Historic Downtown Placerville as well as the 57-acre Gold Bug Park! Enjoy the private feel of this secluded masterpiece, without sacrificing the convenience of downtown living. This home is a must see to truly appreciate all that it has to offer! 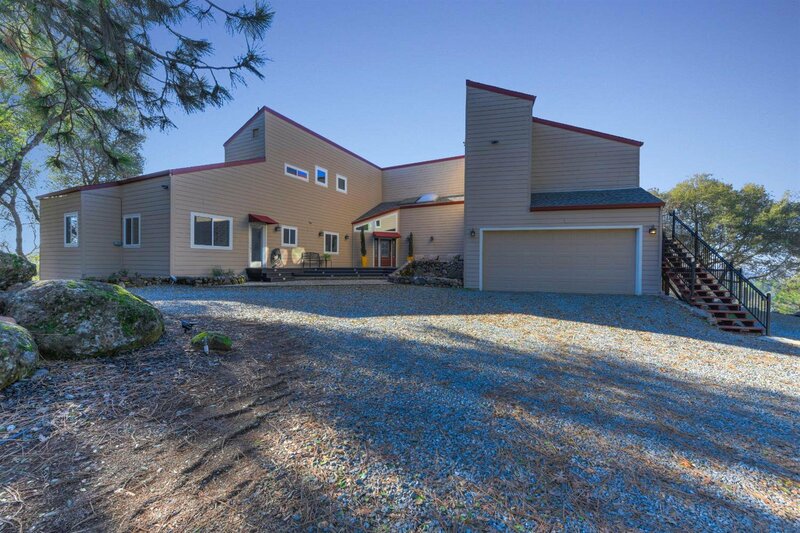 Listing courtesy of Keller Williams Realty Folsom. Selling Office: RE/MAX Gold El Dorado Hills.